I know that it's 80 degrees outside, and fall fashion is far from everyones' minds right now, but indulge me for a moment. Apparently the item to have this fall will be a pair of Lauren Urstadt leather gloves. 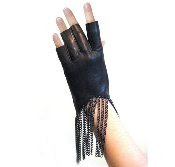 This fringed fingerless version and cropped chain one are my current favorites. Don't say that I didn't warn you. I thought I was the only one who looked forward to fall fashion all year round. I love summer, but c'mon, those gloves are way cooler than any cotton sundress! High Line Finally Open: It's a Party!